Eyeglass users are increasingly preferring disposable contact lenses. They are convenient and more aesthetic. The contacts fit into your eyes in such a way that you barely feel anything inside. It is quite easy to maintain contact lenses and some of them are even cheaper than several high end glasses. Disposable contact lenses are worn for a particular period of time and then trashed. During the maintenance, very little disinfection and cleaning are involved and this is what makes them user friendly. The replacement schedules for these lenses vary from one day to three months. The duration depends upon environmental factors and how well the contacts are taken care of. 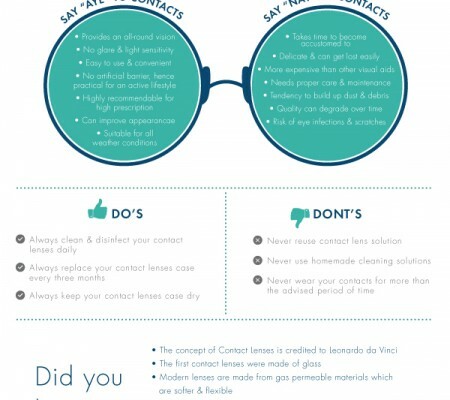 Generally, the schedule for replacement of contacts is around two weeks after wearing. The disposable contacts, meant for daily use, must be removed every night before going to sleep and cleaned. This should be a practice till the wearing tenure ends. But the disposable contacts, which are for extended wear, can be worn overnight. However, one should not forget to clean them daily to avoid irritation, infection, red eyes, blurred vision, giant papillary conjunctivitis and other general discomfort. Disposable contact lenses are a boon for existing users. Earlier, contacts were made of glass. They were expensive and delicate. If by any chance the contact lens got scratched, there was no other option but to replace the pair. The lenses did not even allow exchange of oxygen and water through them to the cornea, resulting in dryness in eyes, irritations and sometimes permanent damage. The biggest advantage is the minimum accumulation of protein, calcium and other pathogen deposits compared to any conventional contact lens worn for extended periods. As chances of pathogen build ups are minimized, the chances of developing infectious keratitis and giant papillary conjunctivitis are also almost zero. Another advantage of these lenses is that you don’t have to buy costly disinfecting and cleaning solutions. These are generally needed for conventional contacts. In this way, chances of solution getting contaminated are eliminated. You can also be assured of no toxic and allergic reactions and ocular irritation which are caused by these solutions. A research was conducted on 900 patients who wore disposable contact lenses for eight months and it was found that compared to conventional lenses, patient satisfaction, visual acuity and patient comfort were higher when disposable contact lenses were used. There were also no signs of infectious keratitis or complications of the cornea. Today, the disposable contact lenses, available in plenty in the market, are of high quality, reliable and relatively inexpensive. The range of styles and designs are huge. But before taking any action, consult with your optician and only if he suggests, proceed with using them. It is advisable to familiarize yourself first on their use and how to take care of them. As per your doctor’s suggestion, find out the requirements of the lenses to use them correctly as per their design and the lenses will, in turn, give you the visual aid you need. 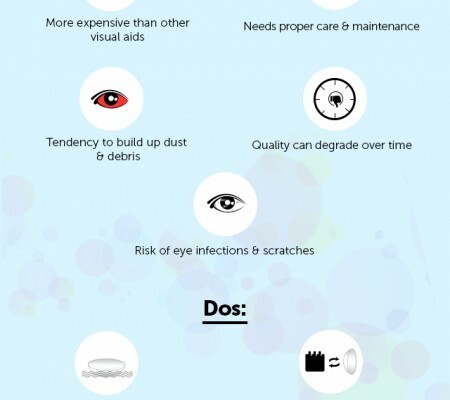 Are routinely cleaned and disinfected disposable contact lenses reusable? 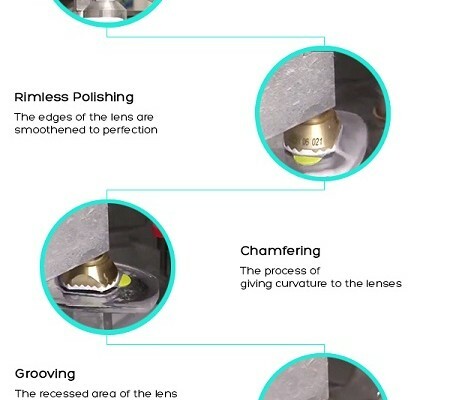 The answer to this frequently asked question is that as these lenses do not differ much from other soft lenses, they can be regularly reused without any adverse effects. It is still a debatable issue and some manufacturers leave it to the eye doctors to decide on their re-use. The bottom line is that disposable contacts are highly sophisticated pieces of equipment. To reap great results, use them as they should be used. After all, you have only one pair of eyes.